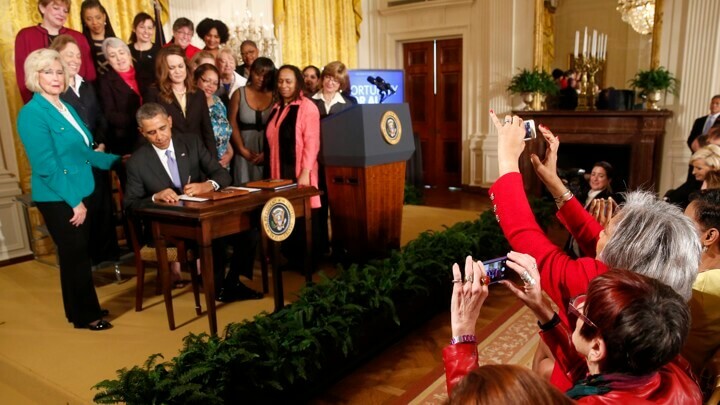 President Barack Obama signs two new executive actions aimed at increasing transparency about women’s pay during an event at the White House in Washington, D.C. on April 8, 2014. For Americans who’ve ever wondered whether the person in the next cubicle doing the same job is being paid more, or those who’d like their companies to take a hard look at inequality on the payroll—there’s good news from the government. The announcement coincides with the anniversary of the Lilly Ledbetter Fair Pay Act, which Obama signed into law in 2009 and allows employees to file lawsuits regarding equal pay for up to 180 days after a discriminatory paycheck. On Friday, Obama will also be calling Congress to pass the Paycheck Fairness Act. “We expect that reporting this data will help employers to evaluate their own pay practices to prevent pay discrimination in their workplaces,” said Secretary of Labor Thomas E. Perez. Regardless of concerns about race and gender discrimination, talking about compensation at work, though a legal right, is often discouraged by managers and bosses. As concerns rise about lagging wages and pay discrimination, pay transparency has become a popular tactic in recent years, with some companies revealing exactly how they calculate compensation to appease their employees. And sometimes, just being forced to look at the data actually helps. The New York Times reports that Marc Benioff, the chief executive of Salesforce, was enlisted to support these new rules. Last year, Salesforce reviewed the salaries of all 17,000 employees after two female employees asked Benioff to examine whether the company paid women fairly. Benioff was skeptical of this claim, but commissioned the internal review anyway. The results surprised him, and the company added $3 million to its payroll to address the inequities.